After completing our party invitation design yesterday, I tackled the place cards today. I coordinated the fonts and colors to the invitations, and printed them on card stock. 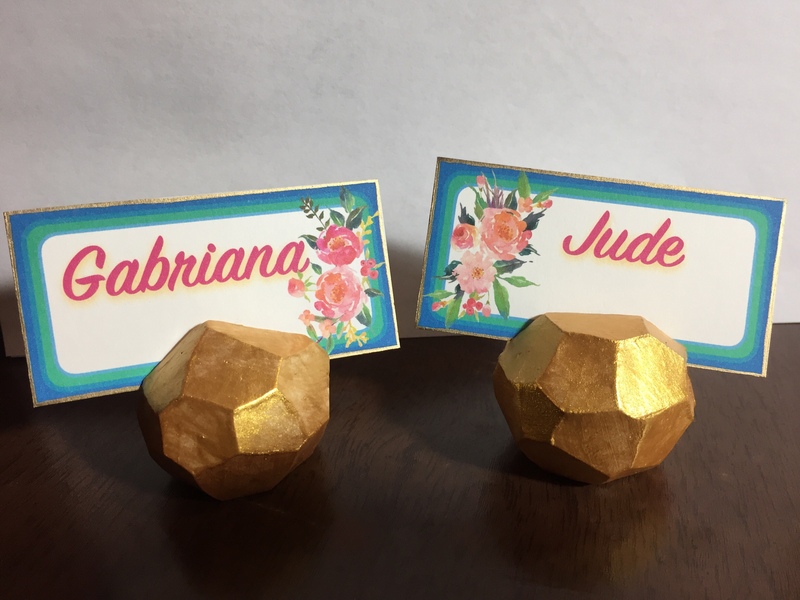 I made the gem-like geometric place card holders using white clay and gold paint (I vaguely followed these instructions). I love working with clay, and the project kept my hands busy while watching the singing shows Mama likes during the last few months. Today’s #OneGoodThing was finishing the design of my place card holders for our Summer Garden Party celebrating Mama’s miraculous beatdown of her prognosis! Day 136 of 365. And Day 867 in a row (here’s the first 366 & the following 365)! Thank you! Wish you lived closer and could join us!! !